Nora Fatima Buffet has an insatiable appetite. She thinks nothing of consuming the huge chocolate cake that her mother has just baked till, caught in the act, she is banished to her bedroom. There, however, she doesn’t confine her guzzling to the stash of snacks in her chest of drawers, she proceeds to devour the furniture, toys and computer (sandwiched in her mattress); all this is followed by her clothes even those she’s wearing… Inevitably, such a mighty feast leads to a vast projectile burp. 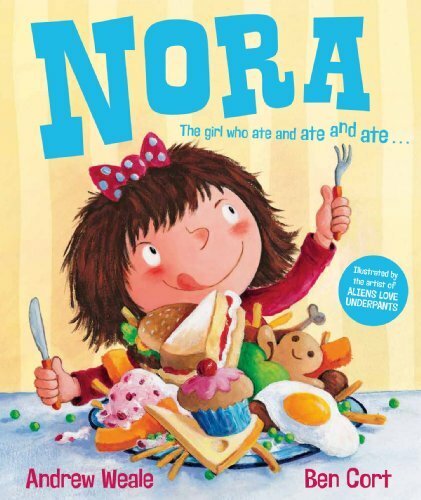 Thereupon Nora is launched lunarwards where, instead of learning her lesson, she finds yet more to gorge on… You’ve guessed it – cheese! There is plenty for the eyes to feast on for sure in Ben Cort’s suitably exuberant illustrations for this preposterous, jaunty, rhyming, Belloc style cautionary tale. It’s one that children will relish.